CSS Selector is the combination of an element selector and a selector value which identifies the web element within a web page. The composite of element selector and selector value is known as Selector Pattern. Selector Pattern is constructed using HTML tags, attributes and their values. The central theme behind the procedure to create CSS Selector and Xpath are very much similar underlying the only difference in their construction protocol. 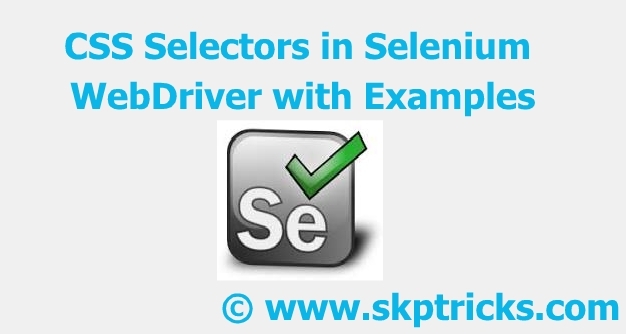 In this post we are going to discuss how to use css selector in selenium WebDriver java. Most of the automation testers believe that using CSS selectors makes the execution of script faster compared to XPath locator. CSS Selector locator is always the best way to locate elements on the page. CSS is always same irrespective of browsers. CSS Selector is faster (especially in IE). In terms of performance, CSS perform well as compared to XPATH. NOTE : While selecting an element make sure that element should be unique, descriptive and unlikely to change. To identify the web element using css selector, we need to call cssSelector() method. In this example we are going to locate "Name" field of user registration page by its attribute using CSS Selector. Following are the possible way to uniquely identify the "Name" Field. Refer the below screenshot, which will help you to identify the element from the webpage. In this example we are going to locate "Name", "Email" and "Password" field of user registration page by its ID using CSS Selector. In this example we are going to locate "Name", "Email" and "Password" field of user registration page by its Class using CSS Selector. In this example we are going to locate "button" field of user registration page by its Class using CSS Selector. In this example we are going to locate "Name" field of user registration page by its Class and attribute element using CSS Selector. In this example we are going to locate "Name" field of user registration page with more than one element using CSS Selector. In this example we are going to Locating direct child or sub child element. Here we are referring "Name" field. Locating the child element ( "Name" field of user registration page ) by element name. In this example we are going to locate nth elements using nth-of-type(N) function of CSS Selector. In this example we are going to locate first element of form that is "Name" Field using :first-child selector. Locating First element using :first-child selector. In this example we are going to locate last element of form that is "Password" Field using :last-child selector. Locating last element using :last-child selector. In this example we are going to locate an element using start with prefix attribute value. Considering "Name" Field of user registration page for this demo. This will help to match the starting characters of attribute value. In this example we are going to locate an element using end with suffix attribute value. Considering "Name" Field of user registration page for this demo.This will help to match the ending characters of attribute value. This method helps to match the substring character from the attribute value. Here we are locating "Name" Field of user registration page. 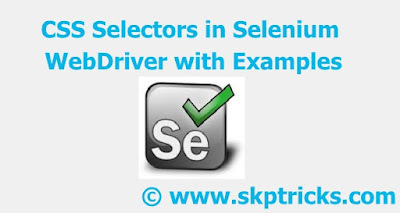 This is all about CSS Selector, which helps to locating an web element from the web page with the help of selenium webdriver. In case of any question, please do comment in comment box below.